Hilly yards look great aesthetically but are difficult to mow. In fact, any incline above 15 degrees is considered challenging given that most lawn mowers are designed to mow up to this level. A ride on model is considered the best lawn mower for hills as they cope well on slopes and can save time if you have a larger yard, however, you shouldn’t rule out walk-behind mowers which can be easier to manoeuvre, quieter and much cheaper. When selecting a lawn mower for a hilly terrain, consider one that will take care of your safety needs. Beyond this, it is vital to learn how to mow safely on slopes. The Earthwise 60418 comes out on top for both values for money and performance. Powerful yet easy to handle with a large grass capture capacity and responsive controls. Which Type Of Mowers Are Best Suited For Steep Hills? Before you make up your mind to acquire a new mower, you need to first check your yard’s terrain. Is it even, hilly, rugged, or loaded with obstacles? Once you have established the landscape of your lawn, you will be in a position to pick the right mower. Keep in mind that if you’re running a lawn care business, your customers will likely have a variety of lawns, so choosing a mower suiable for hills would be a good idea. Pushing a mower uphill or keeping it in control downhill can be quite challenging but with the right mower, you will not only do this with ease but also with less effort. Zero turn mowers are characterized by their ability to make a turning of zero degrees using hydraulic speed. This, in essence, means that this machine can be turned inside its own trajectory. 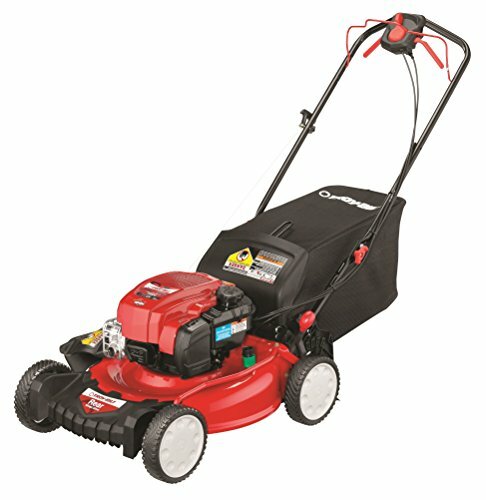 The Zero turn mowers have been found to be quite efficient on larger lawns just like other riding mowers. What makes them distinct is the fact that they have independent power on the rear wheels. The machine is powered by two handles that also acts as its brakes. Stander or walk behind mowers are the safest when it comes to mowing hills as compared to the riding mowers. Furtheron, the standers provide you with the flexibility of positioning your weight to optimize all situations on a hill self-propelled walk behinds are even better on hills as they only require you to press the navigation buttons to maneuver the mower and prevent it from going out of control. Best Lawn Mower For Hills. What To Look For? A hilly terrain certainly provides a beautiful landscaping but can be dangerous as well. For this reason, it may not be easy finding the best lawn mower for hills since they are not as widely available, particularly the ride-on. To ease your search, keep in mind the following factors when going for a mower for your hilly yard. Rear wheel drive provides better traction on hills compared to an all-wheel drive or a front wheel drive. The front wheel will maneuver quite well on even ground but not on a sloppy terrain. Some rear wheel drivers have larger rear wheels than front wheels which is an indication of enhanced traction although not quite necessary. Traction is further enhanced by a low mower profile and trodden tires. A low profile reduces the chances of your ride-on tipping off although quite honestly you still need to take extra caution with these ones. You need to consider the width of the deck as it determines how easily you can maneuver a hilly terrain. For instance, mowing an open yard can be done easily with a deck between 42 and 54 inches. This, on the other hand, will not be ideal for a lawn with a narrow ditch or several obstacles because a wide deck is never great at maneuvering around obstacles. If you decide to opt for a versatile riding mower, do not go for ones with attachments. Extra loads being towed from behind tend to put more weight towards the rear and this increases the risk of flipping over. Some mowers are obviously complicated and will be difficult for the user to operate. Consider features like cruise control which are designed to make it easy and convenient to operate your mower. A heavy walk behind can be strenuous if you are mowing a large hilly terrain because these make use of more of your effort. Consider powerful engines housed within light mowers. Our review today features the 5 top mowers that are great performers on hills. While we have included 2 ride-on for desperate moments, we prefer the self-propelled as they are the safest to operate on hills. Two features make this tractor mower suitable for hill mowing…The TWO 40V Lithium-Ion batteries. In addition and for safety’s sake, this unit is designed with a safety bar for peace of mind when maneuvering and emptying. This makes a bit easy to handle some situations you will find yourself in when mowing. 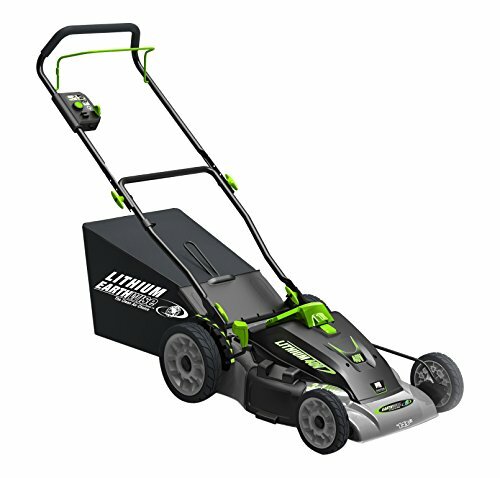 The Earthwise 60418 has 2x Li-ion batteries that deliver premium performance, together with an impressive 18-inch deck that makes cutting grass on slopes easy. The batteries will typically get you around 45-minutes of cutting time. Its compact size at 51 x 42 inches (L X W) coupled with its ergonomic folding handle and large wheels, makes it easy to maneuver around your lawn. Since the Earthwise is an electric-cordless mower, there are no long wires to tangle or risk cutting with the mower in use. It is tipped as the “clean air choice” due to the fact it uses no gas or oil, which makes maintenance and clean up a thing of the past. The wheel size on this model have been made to suit the everyday hilly lawn, with 7-inch front and 9.5-inch rear wheels, the weight balance is evenly distributed given you an easier job when going uphill. There are 3 cutting options on this model, standard cutting and collecting via the rear bag, mulching or discharge. SO no matter what your preference, you can adjust easily. The cutting height can also be adjusted via a single lever on the side, which offers an adjustment of 1.5″ to 4″. One last great feature is the LED battery indicator light, which allows you to see in an instant how much juice is left in the batteries and charge when necessary, meaning you shoukd never be caught out. Very quiet and generous battery power. 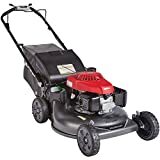 The Honda made lawn mower is another self-propelled machine with variable speed select drive which I find better than four preset speeds in the Troy Bilt TB3300 because it allows you to easily control speed as you mow. The rear wheel drive system is a critical feature for any lawn mower designed for hills. It enhances traction up and downhill although the major duty of controlling the machine safely is still left to you. Now the rear bagger may be something to be concerned about because as in other units it adds weight to the rear of the mower. But because this was taken care of in the design stage and you may not lose traction as the bagger gets full, you may have to empty it from time to time to be on the safe side. Through its Versamow system, mulching, bagging, and side discharge are made quite convenient and we felt that an additional leaf shredding capability was quite in order. The System Lawn Mower’s Clip Director knob is another vital convenient feature you will need to check out. It lets you select how much grass is to be mulched and how much is to be bagged, both in one go without the need for any additional tools. We found the Twin Blade Microcut System in this unit to be quite innovative and important too. These dual blades are designed to deliver ultra fine cuts off your clippings which makes really good mulch. It is equipped with four cutting surfaces integrated within the MicroCut System and does not only provide better-quality mulching ensuring that you achieve just right grass cut but also more allows for more cutting and emptying of the bags within a short time. you only need to sharpen the blades two to four times a year to enjoy the clean laser cut on your lawn. Allows for easy adjustment of its speed by pressing the speed dial and use the engage select drive for comfortable speed control. In addition, the durability of this Lawn Mower is evidenced by its 21 In. deck, made of NeXite, a very durable material which does not corrode or dent over time. Other beneficial features include the fact that the machine is easy to start and fuel efficient, thanks to its powerful Honda GCV190 187cc engine with an Autochoke mechanism. As a user, you can adjust the clip director to mow even in the most severe conditions although this is not advisable. Its deck allows for mulching both high and low grass without leaving the clumps behind. Honda engine delivers great power even for the toughest conditions. 4 in 1 mulching, bagging, side discharge and leaf shredding capabilities. No wash port meaning you have to turn over the unit to clean which can be risky. This lawn mower by EGO Power+ comes as a great recommendation if you are looking for something durable for your sloped yard. 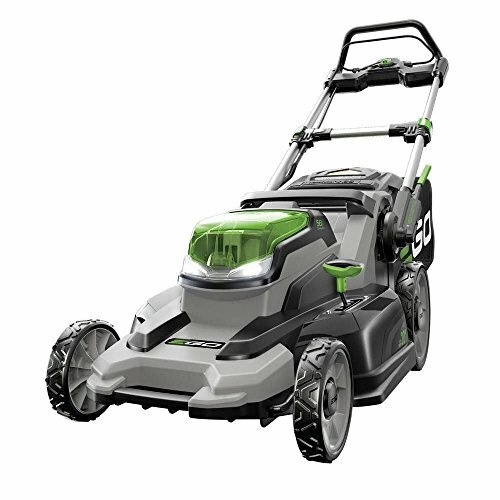 It features an impressive 20″ cut capacity, which is rare in this type of model and the wight at just 56-lbs this one quality qualifies it for mowing the hilly terrain. What I love about all EGO Power+ products is that their batteries are cross-compatible. So this mowers is compatible with all EGO power+ arc lithium batteries…which can save you a fortune over time. There is a tri-cutting action feature on this machine which allows you to mulch, cut and bag or discharge the cut grass. So no matter what your style or requirements, it’s as simple as removing or adding the bag and flicking a handle. This unit, thanks to it’s size and build quality emits 30% less noise than other comparable mowers on the market and it’s 600W, High-Torque, Magnetic Motor is a perfect companie for the Li0Ion batteries and solid housing. LED lights for cutting at anytime, day or night. The neighborhood mower has been lauded on many fronts for its great maneuverability and its compact size and rightfully so. It comes with a 382 cc Powermore OHV engine and a 30-inch deck and will make a great option for residential use. However, just as it is with other ride-on, you may want to use it only on a maximum of 15 degrees incline. The 382 cc Powermore AutoChoke engine with a quick start is a remarkable feature as it does away with priming and choking. It is solidly constructed and comes with a 1.3-gallon fuel tank which in our opinion is a good enough capacity for the homeowner. The tank has a sight window to help you check your gas level at a glance. This powerful engine propels the unit forward to a maximum speed of 4.25 mph and still comes with 6-speed settings that you can select from for a comfortable ride. This unit’s 30-inch cutting deck features 5 preset cutting heights which you can choose from. Along with a manual power take-off, perhaps the best for an easy blade engagement, a feature that most users will be keen on. With an impressive turning radius of 18-inches, it is certainly better at maneuvering compared to the larger units with a bigger turning circle. The 13-inch front wheels and 16-inch rear wheels are definitely great if you are considering traction while mowing your gentle slope. If your yard is standard size with an even terrain or a gentle slope then this mower comes as a great recommendation. The 30-inch deck is not as wide and offers the advantage of great maneuverability. Manual power takes off to make it simple to operate the blades. 18-inch turning radius is good enough to maneuver the unit in tight spaces and around obstacles. Works well only on gentle slopes, not steep. Shorter people found the seat a bit high and uncomfortable for them. The snapper SXDWM82 makes a great option for homeowners with a moderately sized yard with a sloped terrain. It comes with either a 19″ or 21″ deck and is a cordless walk-behind mower. 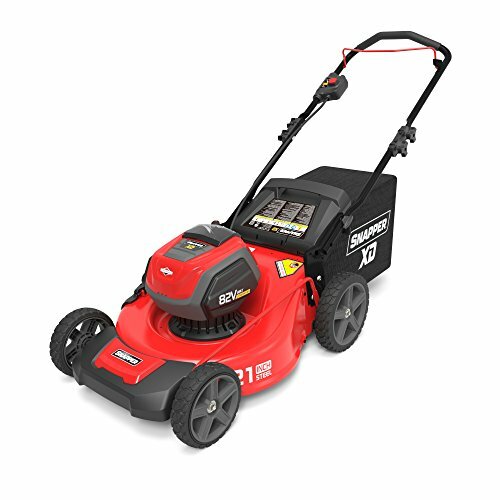 The Snapper is powered by a Briggs & Stratton 82V lithium-ion battery which gives it a generous 45-minute run time form a single charge, meaning it is capable of handling some fairly sized yards. A feature that is most often asked for and rare in these models is the cutting height adjustment. With most walk-behind mowers you get 2-4 different levels, however, with the Snapper SXD there are 7 different height-of-cut levels which are adjusted by a single-lever. At 86lbs this mower is far from the lightest on the list, so if you have a seriously hilly garden then perhaps a light model would be more suitable for you. However, for small slopes and inclines this robust and proven model will make short work of your grass, and without cables to get in the way, the batteries last long enough for a few cuts at least. We have only reviewed top units with remarkable abilities mowing on hills although with varying degrees. Of these mowers, Snapper P2185020E / 7800982 self-propelled lawnmowers came out top with many great user reviews thanks to its innovative convenience features. The 850 Briggs & Stratton Pro Series engine, HI-VAC Steel Mowing Deck, along with a rear wheel drive system, certainly sets it ahead of the pack. Again, it is one of the few lawn mowers for hills that you may look for cons in and never really find. Mowing hills can be a risky affair, however, by exercising safety precautions, you will get ahead quite well. A self-propelled walk behind is obviously the best lawn mower for hills but we included to ride-on for the extreme must-use cases. An important tip is to mow from side to side if you are using a walk-behind or up and down in a single direction if using a ride-on. All the same, it is important to note that a flip on a ride-on can cause a serious accident, therefore, it is always prudent to keep to the mowing precautions. We think that these are the best lawn mower for hills. Do you agree?